Can I make a provisional booking while I confirm my crew’s availability? We can usually “pencil in” a booking for you for up to a week while you confirm the details with your crew or other participants. We do appreciate you letting us know if you decide not to retain the booking. How can I check availability of a yacht? Your booking will be confirmed when we receive a 25% deposit of the charter fee from you, along with proof of acceptable sailing qualifications for a bareboat charter and a signed copy of the charter agreement. The balance of the payment is due two weeks prior to the commencement of your charter. We will require to have a signed and completed booking form and a signed charter agreement from you. For your first charter we will also ask for a copy of your sailing certificates or proof of experience, passport and driving licence. What sailing qualifications do you require for a bareboat charter? 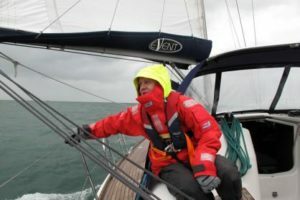 For a bareboat charter our normal requirement is for the skipper to hold a Coastal Skipper Tidal qualification or equivalent experience, and for at least one other person on board to have the equivalent of Competant Crew level of experience. However, we can accept a skipper for our smaller yachts with the equivalent experience of Day Skipper Tidal if there are at least two people on board at that level and after we have had a chat with you to confirm that we are confident that your charter will be successful.If you do not have any formal qualifications but you have plenty of experience then our Fleet Manager will have a chat with you and determine whether he is happy for you to take one of our yachts.If there is any doubt about whether you are ready to skipper one of our yachts then we may suggest that you take one of our skippers with you for a day, and if all goes well he will then leave you to continue and complete your charter on your own. Yachts in charter management must comply with the MCA Code of Practice for Small Commercial Vessels, otherwise known as the “Code”. A “Coded” vessel is inspected annually by the MCA and the managing agent to ensure that the yacht’s structural integrity and equipment continue to conform to the high standards required. The amount of equipment needed to bring a yacht up to coding level will vary depending upon what equipment the yacht already has, however, for a bare yacht with minimum equipment the cost could be as high as £6,000. A comprehensive inventory is essential, but we will be pleased to offer full assistance with preparation for the registration of your boat. Which is the most suitable type of yacht for charter? We will consider most yachts, but the ideal length is generally between 32 and 47 feet. A layout with three or more cabins allows for a much greater flexibility in chartering. Whilst new boats are preferred, we will certainly also consider slightly older, well-cared for yachts. Will I make money from chartering my yacht? You can expect chartering your yacht to cover the majority of costs arising from yacht ownership and in some years may find that chartering provides you with an additional income. We do not make inflated claims and will happily show you the accounts of yachts on our current fleet most closely resembling the yacht that you are considering placing with us. Will my yacht suffer from being used by other people? We thoroughly vet all prospective charterers to ensure that they are capable of handling your boat. If the charterer is responsible for any loss or damage then this is immediately rectified and the cost is deducted from the charterer’s security deposit.We pride ourselves on the standard of our maintenance. Yachts under our management follow a rigorous maintenance and cleaning schedule. Charterers are often surprised by the good condition of even the older boats on our fleet, which despite the additional usage, therefore tend to retain their value better than similar yachts of the same age that have not been chartered.